When I first got pregnant, I was surprised to find I wasn’t feeling nervous about birth at all; that it was just part of the rite of passage of having a baby. I thought to myself, if I could keep this level of calm for the birth, everything would go well. After a lot of research, I decided on a home birth, but I felt that in order to pull it off, I needed to do a lot of mental preparation. 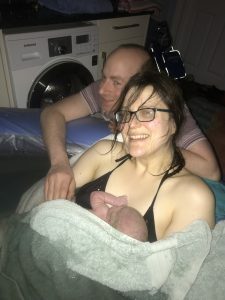 Fairly early on in my pregnancy I had stumbled across a hypnobirthing video – it focused on the mother in a pool, alone, and showed her breathing deeply and calmly at the latter stages of labour. I was stunned – I wanted to give birth like this! How had she stayed so calm? Every time I heard the term “hypnobirthing” from then on, I heard a positive story. I read Marie Mongan’s and Sophie Fletcher’s hypnobirthing books, downloaded the Mindful Mamma meditation MP3s (which I listened to most nights to help me drift off to sleep), and also booked onto a Mindful Mamma course to get some practical techniques to use. Not only was the workshop useful for me to learn how to apply the techniques, it also gave my husband Andy something practical and proactive to do during labour. I also prepared for my birth choice by going to a local home birth group, which increased my confidence in feeling that home birth was the right choice for me, and with support from hypnobirthing, I could do it. As we approached the birth, Andy and I gathered everything we had learnt together. I picked out the techniques from the course and books that I liked the best and thought would work and talked them through with Andy. 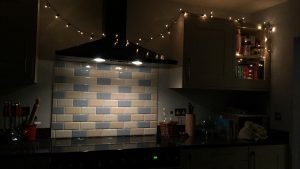 We started thinking about the birth space – our kitchen – and how to set up a pool in there and make it really relaxing (which meant leaving up the Christmas fairy lights!). 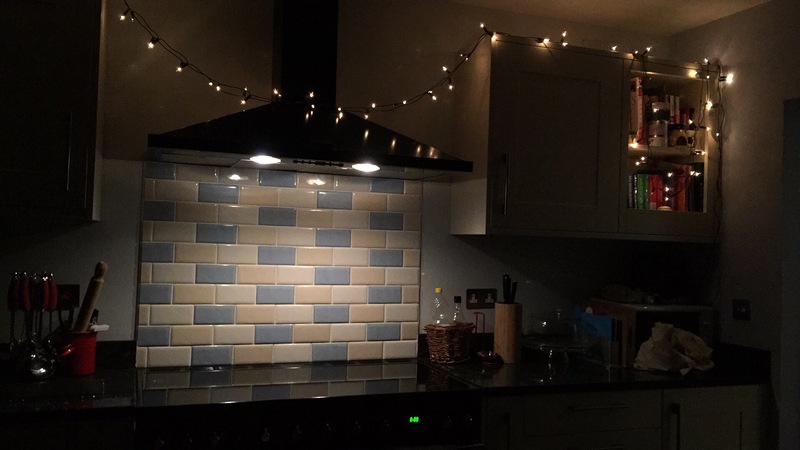 Soon my kitchen was covered in visual and mental aids – mantras, paperwork with tips for labour, scan pictures and pictures to remind me of the meditations I’d covered. As my due date approached, I was ready but not desperate for my baby to be born. One of the mantras I’d found during hypnobirthing was “my baby knows the right time to be born” and therefore I trusted him/her to arrive when they were ready. So instead of worrying or being impatient, I channelled my energy into enjoying maternity leave instead. The night before I went into labour, I told a close friend that I felt suspicious that night that something would happen – and it did! I woke up on the 10th January at 4am with what I described to myself as “painful bowel movements”. I tried to go back to sleep, but I kept feeling the same uncomfortable sensation so eventually around 5am decided to get up and eat something. Having never experienced labour at this point, I wasn’t yet convinced that this was it. I warned Andy that I was feeling something, but decided to wait until 7am to wake him up properly in case it was all for nothing. As time went on, the feeling was starting to become more of a period-pain like cramp rather than bowel movements, and quite frequent but irregular. To take my mind off things I picked up my knitting, listened to my meditation MP3s and labour playlist, and also tried out some deep breathing. I started to become more convinced something real was happening, so just in case, I began to prep and de-clutter the kitchen, turned on the fairy lights, moved the fold-out mattress and my birth ball into the kitchen, and woke up Andy with a cup of tea. I also set my oven timer to display 0:00 so that I didn’t clock-watch throughout the day as I wanted to experience the “time-distortion” that can happen with deep meditation. Whilst Andy finished prepping the kitchen by bringing out the pool and mats, I started to think about using the TENS machine I had bought to see what it was like and if it did anything, and told a friend of mine (who was a big fan of TENS). Her response was “do you really need it?” – and this really caught me in my tracks. If I tried the TENS now, would this lead to a spiralling of different types of pain management and a different direction to where I wanted to go in? As I didn’t *need* it, I decided against trying it out and I really thank that friend for catching me there and then! After timing the sensations I was feeling, Andy suggested we call the midwife as I was still having 3 of them in 10 minutes. Still not really believing I was in labour, I agreed that he should call them, but tell them it’s probably nothing. When the midwife turned up at around 10am and did the first internal examination, I was 4cm dilated! I couldn’t believe it. The next few hours were mostly tea and chat whilst the birth pool was filled. I continued to bounce on the birth ball or laid down during what I now knew were contractions. I was still mostly using long inhalations and exhalations to get through them, but occasionally led by Andy who did the 3-2-1-relax-relax-relax exercise and helped me visualise blowing a feather across a lake. I remember smiling at the end of each contraction and reminding myself that each one would be bringing my baby closer to me. By 1.30pm I was 6cm dilated and the half-filled birth pool was starting to look enticing. Once it was full and I got in, I immediately relaxed into it and it gave me a chance to have a breather as things slowed down for a while (as generally happens in a pool). I also found that I now had control over when I had a contraction. If I stayed still, I didn’t have a contraction and could relax and rest. When I decided to change position, it triggered another contraction. I used this benefit of the pool to pace myself for a while. I was still using long in and out breaths to breathe through contractions at this point. My helpers had been feeding me water and fizzy Lucozade – I soon asked for the fizz to be taken out of the Lucozade as it made me burp when I was trying to breathe deeply! Another breathing technique I used was breathing through the phrasing of the music of the tracks on my labour playlist, which had been playing quietly in the background. My choice of tracks was based on slow, relaxing songs and music with deep personal connections to me – such as our first dance song and some of my all-time favourite tracks. Each track made me smile for different reasons – and I remember smiling after most of my contractions. If a part of the music I really loved came on during a contraction, I really went with it, allowed myself to get lost in the sound for a moment and breathed along with the tune. After an hour or so in the pool, the midwife suggested I get out for a while to get things moving along again. 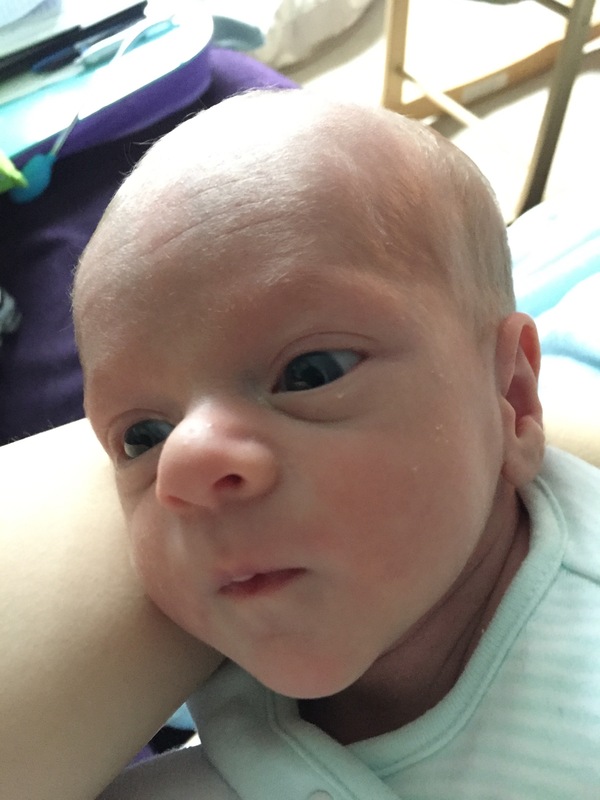 After having gained control over my contractions in the pool, I was reluctant to get out at first as I knew they’d start coming fast again, but I also didn’t want things to slow down to the point they stopped. I decided to get out and got dressed, and sure enough they started up quickly again. My next check was at 5.30pm and at this inspection I was 8cm dilated but the midwife managed to stretch me to 9cm. My waters still hadn’t broken at this point but were bulging and ready to go any second. I could feel the pressure myself and could feel some frustration building. There was some talk about the midwife breaking them for me, but because they were so close, we decided to wait. Sure enough, as I was stood by the pool, they finally gave way and the pressure and frustration subsided quickly. After that, it was time for me to get back in the pool again and back to having control over my contractions. I began to think about what other breathing techniques I had covered in my preparation, and remembered watching a useful video about sounds women make during labour. I decided to try out some “mooing”, conscious that the video had explained that the deeper the noise was, the better – so I focused on trying to keep the noise I was making relaxed and deep. I “mooed” my way through the next couple of hours through to the pushing stage. I also had my first “urge to push” soon after getting back into the pool – it took me by surprise as my body did just take over me for a second and there was nothing I could do about it. At around 9.30pm, the midwife explained to me the “purple line” some women have on their lower backs when they are fully dilated, and that I had a very clear one showing in the pool, so there was no need to do another internal examination or get out of the pool again. As things progressed further and I started feeling the urge to push again, I switched to balloon breath (clenching my fist and blowing into it), which I loved as a technique and had practiced before going into labour – I liked the fact you could feel that breathing that way changed the feeling of the out-breath internally, and would help during pushing. My body switched from letting me have control over contractions to doing what it needed to do – it told me when to push, and using balloon breath, I just had to guide it, hold it and go with it. I spent most of my time in the pool at this point on all fours/kneeling with my arms over my side as it felt the most comfortable, though I was recommended to “squat” a couple of times to allow gravity to give a little helping hand. I started to feel like the head was beginning to come, and the midwife was really encouraging and guiding me at this point, telling me how “open” my body was, to go with the breaths and what my body was trying to do. She seemed to completely get what I was aiming to do with my birth and birth plan. Andy was using the mantras “we’re going to have a baby soon” and “we get to find out if it is a boy or a girl”, and we also used another anchoring technique we’d developed where our foreheads touched and sometimes making eye contact. It really helped me engage with him and what we were doing. My breathing at that point was switching between balloon and deep breathing, and when I felt the stretch as the head started to come, I remember it made me gasp (like stepping on something sharp) – but I still managed to maintain control. As the cycle of the head coming out and contracting continued, I got to a point where I could “hold” the breath and push to stop it retracting in so far again, and each contraction then made the next push and stretch a little stronger and motivated me to keep going – our baby would be here soon if I kept doing this. As the stretch got bigger and bigger, eventually there was one more “argh” from me, and the head came out. I was encouraged to give one more little push to get the chin out, and remember it felt like a little “pop” as it was born. Andy remembers that seeing the head there staring out of the water was a very strange experience! With one more big push, the baby came out and was guided straight up onto my chest and wrapped in towels in the water. I asked the time and was surprised it was still the 10th January, at 11.29pm – I thought I’d laboured into the next day. At this point, I was sitting back in the pool and Andy was round me, with the baby on my left side. We looked at each other and then I held the baby back slightly so we could see – and as we suspected (and secretly wanted, but wouldn’t admit it), he was a boy! Just to say a massive thank you for all your advice and support at the Mindful Mamma course and home birth group. I hadn’t even considered home birth until you suggested it may be a good option for me on the course and I’m so glad you did. I had a very positive experience giving birth to baby Sara at home on Monday. The pregnancy, the birth and these early days after have all been enjoyable, the complete opposite of my first experience with my son. I was able to manage my contractions so well, when I called the midwife I thought I had ages to go but within 5 minutes of phoning I couldn’t fight the urge to push! So baby Sara actually arrived before the midwife! My mum called 999 and the paramedics arrived just as the head was born, 3 pushes and she was out. Although it didn’t quite go as planned it was a very positive natural experience and everything I’d hoped for. So just a big thank you once again!